The National Art Education Association annual conference was in Boston this year, convenient for me considering that I live in the Greater Boston area! 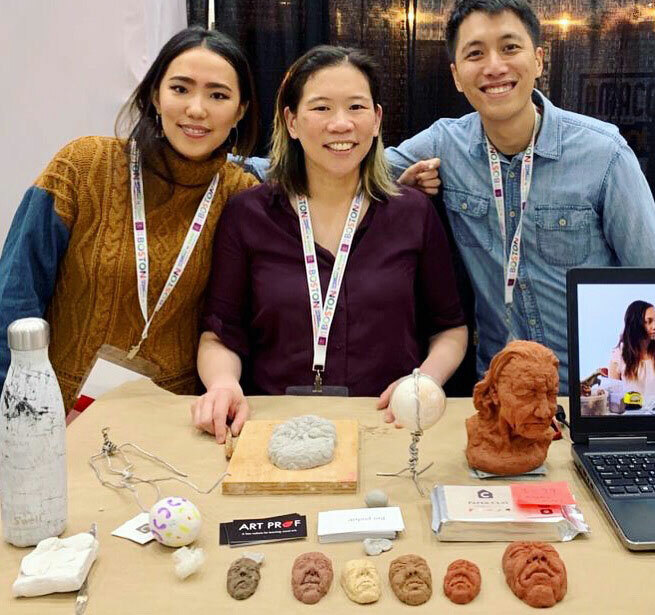 While it was a big bummer that my two session proposals weren’t accepted for this year’s conference, it was really fun to do clay demos at the Clay House Art booth in the exhibitor’s hall. The exhibitor’s hall is gigantic. Imagine rows and rows of booths with retail art suppliers, colleges, and other art education resources. It’s a virtual playground for art teachers, where you get to pick up freebies and test out all kinds of art supplies. On top of that, air dry clay has always has a reputation for being an inherently awful material: it smells bad, is sticky, comes in ugly colors, shrinks, cracks, and is terribly heavy. For most art teachers, oven bake clay was the closest to air dry clay you could get, but even oven bake clay has it’s problems: you can over bake it and burn it, it’s pretty hard when you take it out of the package, and it can crack when sculpted over a wire armature. I started chatting with Phil and quickly discovered as he showed me samples to touch that Angie and Phil had invented a revolution in air dry clay. Not only did their clay not have any of the shrinking/cracking problems, but it sticks to itself (even when fully dry) and other objects, (like wire armatures, wood, and metal cans) was so soft and pliable when it came out of the package, had no smell, and came in an amazing assortment of contrasting weights, textures, and colors. Mostly, their clay just felt good in your hands! I was floored by their air dry clays. I hadn’t done any figure sculpture tutorials for Art Prof at that point because I knew that most people who use our site don’t have access to a kiln. Casting is an incredibly complex and difficult process to teach, and I didn’t feel good about telling people to use air dry clay when I knew what a frustrating material it was. Meeting Angie and Phil changed all of that! I kept in touch with Angie and Phil and we ended up producing 3 tutorials featuring their clay: Stop Motion Animation, Figure Sculpture, and Portrait Sculpture. and so here we were this month, reconnecting in Boston! We discovered over giant bowls of hot steaming Vietnamese beef noodle soup how similar Art Prof and Clay House Art are. Even though our focuses are really different, with Clay House Art producing the clay, and Art Prof providing instructional materials, our outlook and approach to business is very similar. Both Art Prof and Clay House Art were created completely from scratch just a few years ago, and so we all have a personal investment in our work that is intense and different than if you work with a large company that has been around for many decades. (both of us have used our living rooms to pack and ship various items!) Despite how new and small Art Prof and Clay House Art are, we both have big visions and plans for the future, so stay tuned! 0 responses on "Clay House Art at the NAEA Conference"